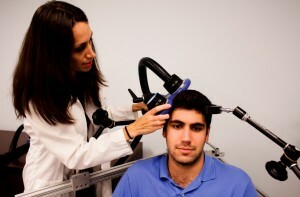 In a pilot study, repeated transcranial magnetic stimulation (rTMS) reduced cocaine cravings and usage among people with cocaine addiction. RTMS is a non-invasive treatment in which a magnetic coil placed near the skull transmits electrical signals to the brain. It is an effective treatment for depression, and there is growing evidence that it may also be able to treat addictions. Participants in the pilot study by researcher Antonello Bonci and colleagues received rTMS directed at their dorsolateral prefrontal cortex or pharmacological treatments (including medications to manage depression, anxiety, and sleep problems) over a 29-day study period. Among the rTMS recipients, 69% remained cocaine-free during the study period, compared to only 19% of those treated with medications. Those who received rTMS also reported fewer cravings. There were few side effects among those who received rTMS, and there was a 100% compliance rate among the 32 participants, meaning they all showed up for each of their sessions. Bonci and colleagues are working on a larger study that will compare rTMS treatment to a sham procedure rather than to a medication regime.